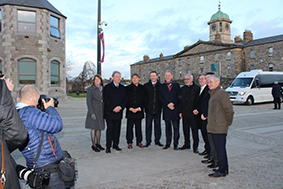 The President of the European Investment Bank (EIB), Werner Hoyer toured the Dublin Institute of Technology (DIT) Grangegorman campus today as the Institute prepares for construction to begin on the next phase of campus development in Grangegorman early next year. DIT President, Professor Brian Norton and CEO of the Grangegorman Development Agency Mr. Gerrard Casey, led the party, which included Minister for Finance and Public Expenditure & Reform, Paschal Donohoe TD and Minister for Education and Skills, Richard Bruton TD, through plans to start development of two academic quads early next year. The new academic buildings include the East Quad, which will be home to students of Media; Music and Drama; Creative Arts and Social Sciences, and the Central Quad, which will accommodate DIT students studying Science and Health programmes, Electrical and Electronic Engineering, Hospitality Management; Tourism and Culinary Arts & Food Technology. Financing for the project will be completed shortly by EIB, the largest public bank owned by and representing the interests of the 28 European Union Member States. From Saturday 9th December, visitors to Grangegorman will have the option to alight at the Grangegorman stop of the new Luas Cross City, only three stops from the city centre, while entry to the campus from the Broadstone-DIT stop will be available in the coming months. Together with the existing academic, research, industry and incubation spaces, health provision and primary school in Grangegorman, the additional investment will underpin rejuvenation of the North West quadrant of the city.